Insurance and Risk Management is published twice annually. Its mission is to present studies and research papers on the principles and practices of insurance and risk management applied to all types of insurance policies and markets. 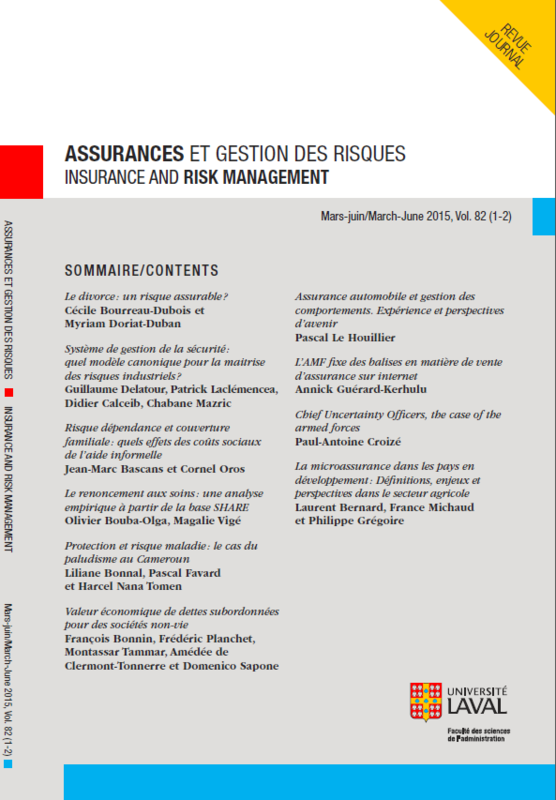 Insurance and Risk Management is publishing papers dealing with the Canadian as well as the international markets for insurance. It is also interested in all legal and historical aspects of insurance products and markets. The Review encourages the submission of papers dealing with international comparisons and literature reviews on theoretical and practical principles of insurance. The journal is helped in its mission by in international board of associate editors contributing to the quality of publications and information. Manuscripts to be published under the “Academic articles” section are evaluated by two members of one of the Journal’s committees and/or by external referees. Manuscripts to be published as “Professional articles” are also evaluated by members of the Management Committee. The evaluation and decision process are under the responsibility of the Director or the Editor-in-Chief of the journal.